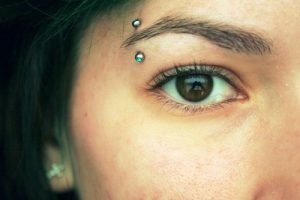 Eyebrow piercing is a vertical or horizontal surface piercing near or on the eyebrow. Punk Subculture introduced it in the 1970s as a fashion statement. 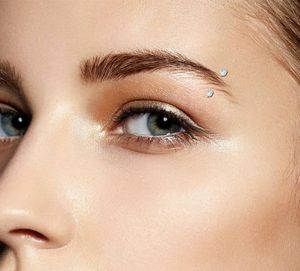 From Black Eyed Peas singer Fergie to Korn front-man Jonathan Davis there are several musicians and even actors who have this piercing. Jewelry will set in place after this. It is the standard type of piercing made across the ridge of the brow. It can be done on either side and at any part of the eyebrows. The most common placement is at 35 degrees angle from the outside corner of the eye. 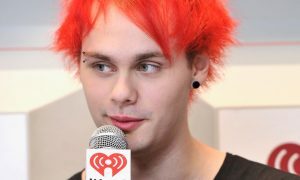 It is less famous than vertical piercing and is placed alongside the ridge of the eyebrow. 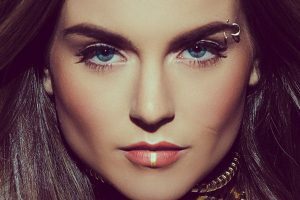 The usual placement of the piercing is towards the outer corner of the eye. 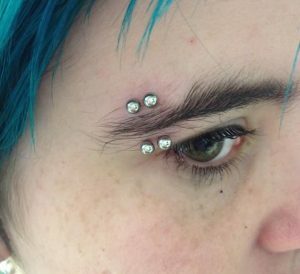 More than one piercing if done across or along the ridge is usually known as Multiple piercing and includes Double Eyebrow Piercing and Triple Eyebrow Piercing. 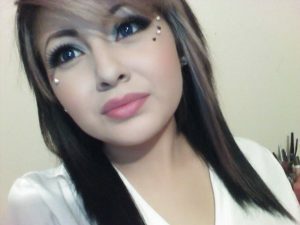 It can also be the combination of both vertical and horizontal piercings. 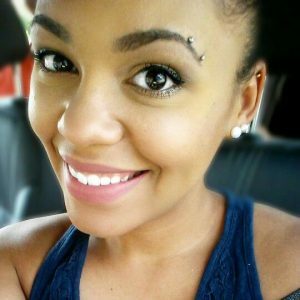 “T” eyebrow piercings are a multiple eyebrow piercing that always stands out of the crowd. 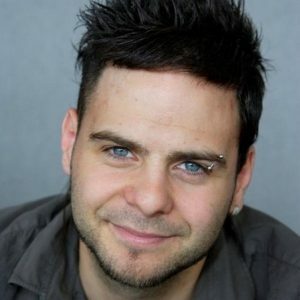 Ensure that the piercing takes place complying the safety procedure, then eyebrow piercing is generally safe. There are still some potential risks that follow and therefore it is advised to go to an authentic parlor to meet the purpose. A sterilized needle used in the piercing. There is also a risk of rejection if it is not deep enough. However, a shallow hole increases the chances of jewelry migration. There is also a chance of infection if you do not follow necessary aftercare after the piercing. Ensure that your hands are clean before touching the piercings. Take supplements like Zinc, Vitamin B and C to promote the healing process. Clean the area regularly with saline water using a cotton bulb. This minimizes the chances of an infection. Another cleanser like H2O Ocean is also fit to use. Do not clean the pierced area vigorously. Do not let the soap accumulate near the piercing while taking a shower. Avoid going for swimming or bathing in the bathtub as these harbor infection-causing bacteria in high numbers. Do not remove your jewelry soon after the piercing as it may block up the piercing. It will approximately take 5-6 weeks to heal completely. However, before it repairs completely there may be some redness in the area and bruises might appear. Infections can prolong the healing period. In that case, consult a doctor. 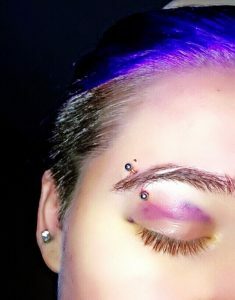 Excessive swelling, itching, and irritation in the piercing area. Redness may also accompany pain. Infection can also cause redness in eyes as it is very near to the eye area. Formation of pus is a sign of an infection. Healing an infection can take 2 to 3 weeks. Clean the area regularly with saline water. Take medicines as prescribed by the physician. Use clean towels and handkerchiefs to wipe the infected area. 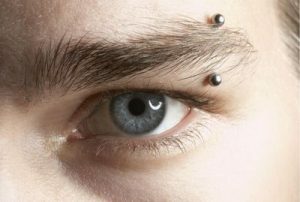 Curved or straight barbells, CBRs, Fixed bead rings, studs, spikes all go well with the eyebrow piercings. It depends on personal choice. The jewelry can be entirely metallic, or a combination of engraved stones in the metal piece. 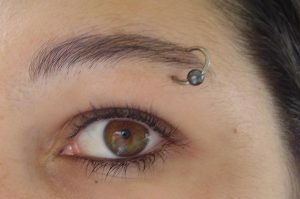 A typical eyebrow piercing i.e. 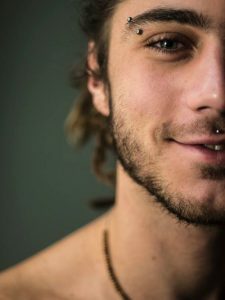 a vertical surface piercing can cost up to $20-$70. Depending on the cost of jewelry and choice of parlor the cost may vary.